Cardiff now has its own civic crowdfunding platform called ‘Make the ‘Diff’. The website has been created to help individuals, community groups and organisations raise funding and help support positive change in local communities. Crowdfunding was created to allow people to raise money for their project, product, or other idea through the use of specific crowdfunding platforms such as ‘Make the ‘Diff.’ People or businesses can pledge as little or as much as they wish to causes that appeal to them. If you have a project, initiative or idea that needs backing or investment, this may be the right platform for you to showcase it! Anyone can propose an idea or initiative. Whether it is big or small, the idea can be uploaded on to the site to try and encourage of people to donate some funding. With specialist crowdfunding sites and the fast-paced nature of social media, crowdfunding has really taken off and people’s ideas can reach a large audience very quickly. A recent example of this in Cardiff involved a night shelter run by homeless charity, The Wallich. Using a crowdfunding platform and social media, the charity successfully raised £21,000 to enable them to support their activities. Crowdfunding is another way to kick start projects which in other parts of the country have ranged from free public Wi-Fi networks, street art and community food growing schemes. If you have an idea that you would like to take forward, visit Make the ‘Diff or email makethediff@outlook.com with information about your project to find out more. You can also tweet at @MaketheD1ff. 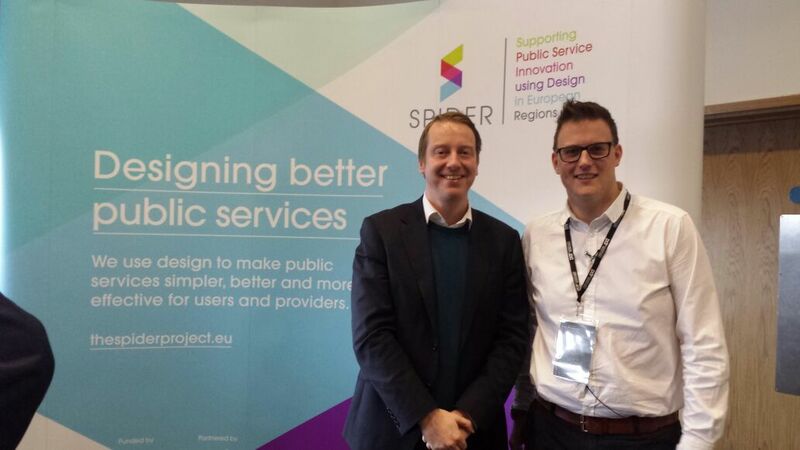 Last week I was invited to speak at the SPIDER project’s ‘Service Design for Public Services Conference’ here in Cardiff’s Millennium Centre. SPIDER – which stands for ‘Supporting Public Service Innovation using Design in European Regions – is an international project co-financed by the European Union and the Welsh Government. The project involves cities and universities from Ireland, France, Belgium and Wales working together to improve the way complex but vital public services are delivered. Given the financial challenges facing our public services, we now have little choice but to innovate. We will need to be creative, to come up with and have the courage to experiment with new ideas. Most importantly, we’ll need to work with partners – with the people who use the services to understand from perspective, with other public service bodies to make sure that we’re providing a joined up service which makes sense to the people using it, and with universities and international cities to share better practice and how we can learn from this here in Cardiff. The SPIDER project ticks all these boxes, and I know that the work of the project team has already led to changes in the way we in Wales tackle youth unemployment and how we support people suffering with dementia. In the photo above, I’m stood with Paul Thurston, Head of Service Design at PDR – the National Centre for Product Design and Development Research at Cardiff Metropolitan University – who helped organise the event. Cabinet have agreed to look at establishing a new heritage trust to manage Cardiff’s most iconic buildings including; Cardiff Castle, The Old Library, Mansion House and Norwegian Church. Under the proposal, the City of Cardiff Council will remain the owner of the venues, collections and content, but the premises would be leased to a trust. Establishing a Trust may help secure the long-term future of highly valued cultural assets. With tourism in Cardiff contributing £1.5bn to the Welsh economy, it is imperative that we protect these landmarks for future generations. Creating a heritage trust would mean that these historic facilities would be eligible for more grant funding from bodies such as the; Heritage Lottery Fund, Welsh Government and the Arts Council for Wales and could also attract more donations and sponsorship than an in-house model. Under this approach, income generated by the venues would be controlled by a board of trustees and would be invested directly back into the facilities. It is hoped that the trust could be fully operational by April 2016 with the potential to create a stronger brand on behalf of the capital’s heritage, translating into real benefits for the city and for Wales.